Brooks Glycerin 16 are neutral cushioned running shoes. 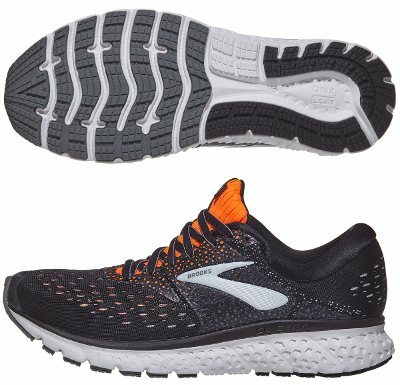 When talking about comfort and plush cushioning it is time for new Brooks Glycerin 16 to show up and engineers from the american brand have developed new DNA LOFT foam, softer than DNA AMP one premiered in Levitate. Market share in the USA is bigger than in Europe where its competitor Asics Gel Nimbus 20 takes the lead despite the high price so marketing department from Brooks is trying hard promoting Glycerin 16 here (not explicitly) and there instead of setting a lower price that maybe could persuade potential users to buy it. Changes from its predecessor Glycerin 15 take place also in the upper which looks more modern featuring a double layer Jacquard mesh with fewer fused elements, just the minimal 3D Fit Print wrapping midfoot for secure and adaptive fit. Internal bootie construction provides outstanding comfort and prevents chaffing while well padded heel collar is similar to solution seen in its smaller sibling Ghost 11. As mentioned above, midsole in Glycerin 16 is completely made of new DNA LOFT foam for premium comfort and external notches in midsole wall suggest computer based configuration made by Brooks to reach the target. Although not official yet, it is likely its counterpart with pronation support Transcend 5 will also move away from Super DNA but to embrace firmer DNA AMP. Not its strongest point but outsole remains pretty much the same with full-length ground contact and plenty of winding grooves in the forefoot to promote flexibility to the maximum extent possible for this kind of running shoe while still using IDEAL Pressure Zones to disperse impact away for smooth and uniform transition. As expected, harder rubber (HPR+) is used in more exposed areas to increase durability.